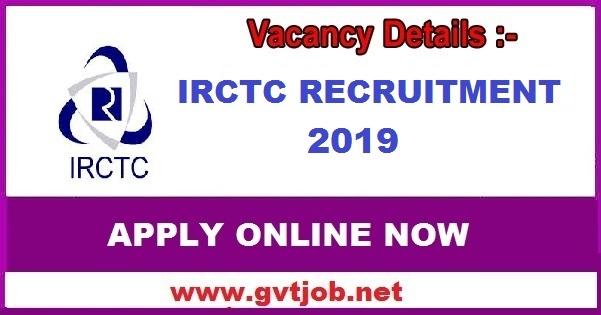 Government Job: Interviews have been organized for recruitment in many positions in the Indian Railway Catering and Tourism Corporation (IRCTC). Those candidates who are interested in applying for the posts of Supervisor. He downloaded the official notification for official application on 50 posts of Supervisor and read from the official website and be aware of the date of the interview. Minimum age of candidates is fixed at 18 years maximum of 30 years. Candidates must pass a minimum B.Sc. examination and other educational qualification from a recognized institution/university. See the notification for more information regarding educational qualification. Interviews will be conducted for candidates. Interview for interested candidate will be held on 25th February 2019, 05th March, 11th March and 15th March 2019. According to IRCTC Notification 2019, interviews and addresses have different dates, so download the IRCTC official notification 2019 for the applicant's special positions. Interested candidates should go to the official website before the end date and download the notification to be fully aware of the information. The selection of candidates will be based on medical test and interview. Click here for government job-related information.